For example, in the semiconductor industry a typical application is preparing the surface of a leadframe, and the dies mounted on it, with plasma cleaning. This is typically done prior to the wire bonding process with the purpose of increasing the bonding yield. It is also done before the molding process to ensure the removal of voids and delamination, thus increasing the package yield. Cleaning System Data Sheets to learn more! Semiconductor manufacturing processes are intended to build each individual die so that it performs according to specification. However, manufacturing issues during processing, variation in the process variables and cross contamination from other processes may cause some die to fail due to a phenomenon called NSOP (Non Stick on Pad). NSOP defines the event detected by the wire bonder when it senses that the bond just created was unsuccessful (no adhesion between the wire and the die’s pad surface). An example of how plasma cleaning can help solve this problem comes from an experiment where a gold-coated palladium bonding pad has been developed to reduce silicon cratering. The assembly, while improving on its hardness, has shown a high rate of NSOP due mainly to the presence of surface oxides. To reduce or eliminate these oxides, a plasma of Ar/H2 was used to form hydrogen radicals and react chemically with the metal oxide. The removal of metal oxides is more effective and faster using Ar/H2 compared to pure argon ion bombardment. An experiment was defined using pure Ar and Ar/H2 plasma cleaning. A significant reduction of the NSOP rate was observed using Ar/H2 compared to Ar alone and Ar/H2 contributed to achieve higher wire bonding yield. In other cases, argon alone is also very effective, especially if argon plasma is generated at lower pressures. As we can see, plasma cleaning can substantially modify the surface of a metal substrate or a die’s pad. By effectively eliminating the cause of NSOP, plasma cleaning can participate actively in increasing the wire bonding yield. Preparing the surfaces of the dies and leadframes with plasma cleaning will increase the bondability of that specific assembly. Removing organic contamination or oxides left behind by previous process steps like die attach or snap curing are an easy task for a good plasma cleaning system. The wire bond pull and shear forces will increase, creating a much more reliable bond improving the overall bonding yield. An increased yield means a higher ROI for that particular product – so much so that the investment for a plasma cleaner could amortize rapidly. In upcoming blogs, we will explain what plasma is and how it is controlled inside a vacuum chamber. We will also talk about various applications, the importance of mechanical and software design in good plasma cleaning processing, and we will look at the different models we offer. 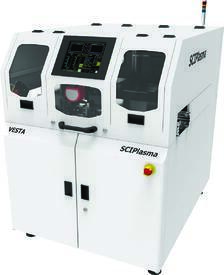 SCI Automation, with its trademark SCIPLASMA, has over 14 years of experience in designing and manufacturing plasma cleaning systems. If you have any questions regarding your applications, please do not hesitate to contact us. Amy, A.; Infineon Technol. (M) Sdn. Bhd., Batu Berendam, Malaysia; Ying, L.C. ; Xavier, A. An Alternative solution for Non Stick on Pad on gold-coated palladium bond pad. Electronics Packaging Technology Conference (EPTC), 2012 IEEE 14th.